I used to run up and down the stairs from the house to the yard every day without stopping to look at them, without feeling any pain. That’s not easy anymore. I still run up, but sometimes it takes me a while to gather my energy to leap. And going down the stairs? No, thanks. Especially at night, I can hardly see them. So Ellie picks me up before our walk and at bedtime and places me on the grass or the sidewalk. I struggle to escape when she picks me up. I’m a guy! I’m tough! Well maybe not so much anymore. But I still want to do it myself. Ellie gives me treats in the backyard every day. It has something to do with a metal pathway with a scratchy surface. She puts it down on the grass and holds out a treat for me. Sure, I want the treat. (It’s a piece of some little hot dogs that come out of a tiny jar…why are they called hot dogs?) So I jump up to get the treat and land on the grass or on the metal thing or halfway on each. Usually the treat lands in the grass, since I can’t find it in her hand. 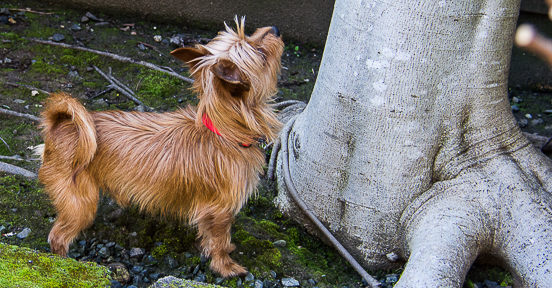 Then I sniff for it in the dry grass while she waits. After a few tries, she gets at one end of the pathway with me at the other and beckons for me to come get the treat. Sometimes I run all the way down the metal to her and grab my treat. When that happens, she’s jumping up and down. Before we’re done, Ellie moves the metal thing so one end is on the deck and the other is on the grass. She climbs up to the deck and asks me to come up the ramp for my treat. I have to think about it. Sometimes I’m feeling the breeze or a fly going by or I hear a noise behind me. Sometimes I walk up the ramp and she gets all excited. Then she tries to get me to walk down the ramp, but so far, that doesn’t appeal to me, no matter how many treats she has in her hand. You must think I’m nuts. I don’t want to be picked up, I don’t want to go down the ramp or the stairs, and I don’t want to pee on the floor. That’s just the way it is. TIme for a nap. 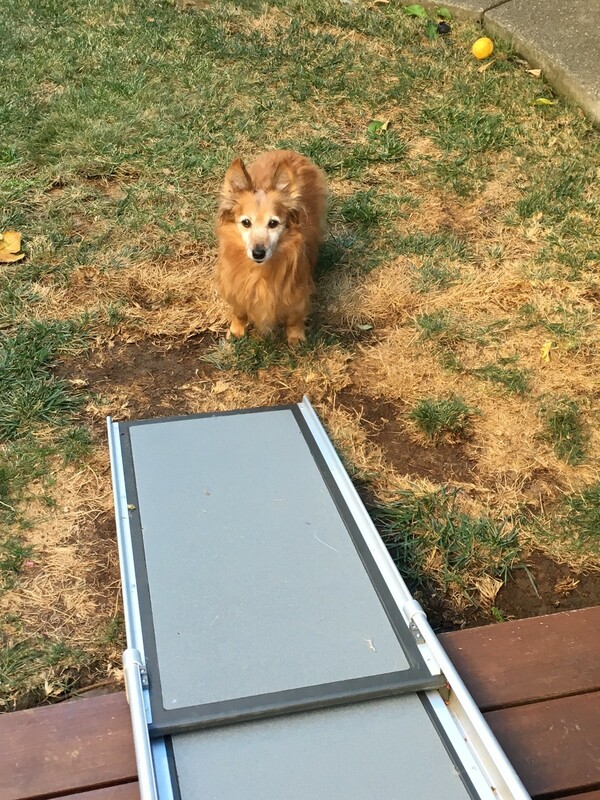 This entry was posted in dog writer, Memoir, Pets and tagged aging dogs, anxiety, dog mobility, ramp by Lenore Hirsch. Bookmark the permalink. Great article. We needed a ramp to load our aging lab in the car. We got one here: http://www.loadingrampstore.com. It works great for the side door or trunk. Thanks for your comment. The ramp is great, even does fine in the rain. I just can’t get him to use it. I think it’s because his eyesight is so poor.